What Is a Good Vertical Jump for High School Athletes? Assessing your vertical jump height can give you an idea of where you rank compared to other student athletes, and can clue you in to whether you need to work on your jump height before you try out for a sport. 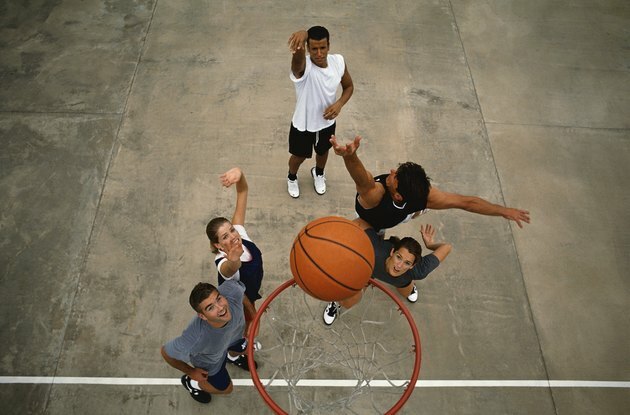 When you can get higher vertically, you have an advantage in basketball, volleyball, football, and track and field. A good high school athlete will have a vertical jump of 24 to 28 inches. A very good jump would be in the 28- to 32-inch range. An athlete with an excellent vertical jump would rise 32 to 36 inches. Anything above 36 inches would put a high school athlete at the top of his class. When Michael Jordan was at the peak of his career with the Chicago Bulls, his vertical jump was measured at 43 inches. Vertical jump is largely a function of strength. The stronger you are in your legs, hips and core muscles, the more power you will be able to harness when you jump. Power in your legs, hips and core muscles will give you the ability to get higher in your leap. Strength workouts that include squats and lunges will give you the ability to jump higher. According to sports coach Brian Mac, if you are a heavier person, you need to apply more power to achieve the same jump height as a lighter person, because you have a larger mass to move. Once you have developed strength in your legs, hips and core muscles, developing your jumping skills with plyometric training will help you jump higher. High school athletes can do this by standing to the left of a 15-inch box and jumping over it so you are on the right side. Do 10 back-and-forth jumps and then take a one-minute break before repeating the drill. Basketball players want to increase their vertical jump so they can dunk the ball or have a chance at becoming a better rebounder. Football receivers who can increase their vertical jump have a chance to go over the defensive back and make a key catch. A soccer player may be able to get over the top of the defender and head a shot into the goal. In addition to the benefit vertical jump can bring in each sport, it can help make an athlete more confident every time he competes in his chosen sport.